The term “comfort food” originated in the US, and I’ve heard it used In Italy only recently, mostly by food-bloggers. That’s not to say that we didn’t have comfort food before, we just didn’t have a name for it. On top of that, our choices are often different. Where you go for hamburgers, we dig into spaghetti; when you take out the ice cream, we open the Nutella jar. 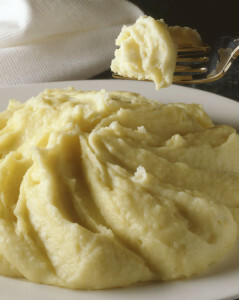 There is one exception, a unifying, universal ingredient: mashed potatoes. 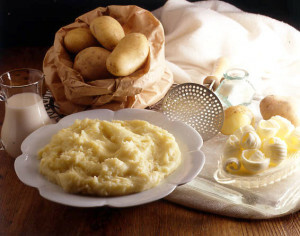 In Northern Italy, when a mom wants to comfort her kids after a not-so-great grade at school, a broken heart, or simply a long week of rain, she will serve this crowd-pleaser as a side: Pure’ di patate (potato puree), a silky, creamy and scrumptuous blend of starchy potatoes, milk and butter. 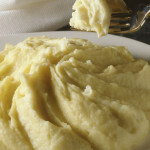 While mashed potatoes can be dry, lumpy, hyper-garlicky, and even gloppy, puree is velvety smooth, and will win the pickiest palates over with its decadence. Not even your carb-phobic friends will be able to resist it. * for a non-dairy version, replace the butter and milk with olive oil and vegetable broth. * *if you are watching your weight, you could replace the whole milk with 1% and halve the butter; but do add some butter for flavor. *** If you need to reheat it, you should add a little more hot milk or broth. Cook the potatoes with the peel (whole, if they are small-ish, or halved or quartered if they are very large) in a pot of salted boiling water (30-45 minutes). If you are in a rush, you can cook them much faster in a pressure cooker or even in the microwave (about 15 minutes). Test them with a fork to make sure they are soft, and drain, discarding the cooking water. Allow them to cool until they are still very warm but not too hot to handle, and peel them. Put them through a ricer or potato masher, gathering them back into the pot. 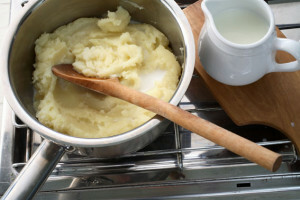 Place the top over low heat and add the butter, and then slowly the hot milk, stirring with a wooden spoon. Keep stirring until the puree is soft, smooth and silky! Adjust the salt, add a pinch of nutmeg, and serve immediately. CALORIES AND FAT: ignorance is bliss! Cook the potatoes with the peel (whole, if they are small-ish, or halved or quartered if they are very large) in a pot of salted boiling water (30-45 minutes). If you are in a rush, you can cook them much faster in a pressure cooker or even in the microwave (about 15 minutes). Test them with a fork to make sure they are soft, and drain, discarding the cooking water. 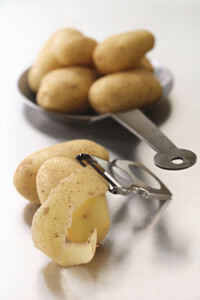 Allow them to cool until they are still very warm but not too hot to handle; peel them, and put them through a ricer or potato masher, gathering them back into the pot. Smooth and silky! Adjust the salt, add a pinch of nutmeg, and serve immediately. * if you are watching your weight, you could replace the whole milk with 1%, but do add some butter for flavor. * If you need to reheat it, you should add a little more hot milk or broth.